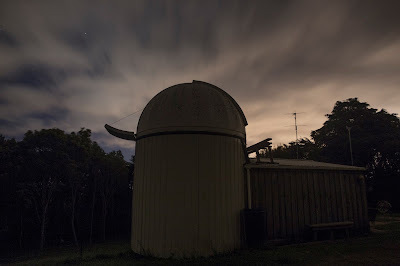 Got out to the observatory early last night which was lucky as the clouds rolled in by 8:30 pm, after setting up I ran an auto focus run in MaxIm DL and got a full-width half-maximum measurement of 2.8 on the focus star, so it must have been better "seeing" than the previous night I guess, I then set about doing a new pointing model but this time I started on the eastern side of the sky, unfortunately every time the mount pointed towards the south eastern part of the sky the mount would become confused and want to point towards the ground, so I'm now thinking this it's not a mirror flop issue at all, it only seems to happen in this part of the sky, once it happens the mount will not point to anything accurately again until it has been homed again, which I know you can't home the mount while doing a t-point model as this will change the parameters, so this is an issue that will need to resolved if we ever plan on capturing a dense full sky pointing model, I'm really perplexed as to what could be causing this problem, it's the same problem that stopped my previous nights pointing model run after already capturing 56 sample points! After attempting a pointing model on the eastern side a few times with the same result the clouds came rolling in and put an end to any further attempts, so I just re-loaded the previous nights pointing model and slewed the telescope around a bit with the dome slaved to see if I could refine the parameters so that the telescope would be pointing in the middle of the shutter every time as Steve had shown me how to do that, before I could make any adjustments though, the dome started to inexplicably stop stopping where the telescope was pointing, it would just continue around and around doing full rotations until aborted in the Lesve Dome control, so it was being a bad slave to say the very least! 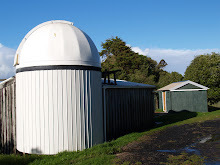 I homed the dome but then found the dome would no longer park either, so being a bit frustrated and having no idea how to fix the problem I just closed up up the observatory and headed home.